Home » Inspiration » My Book Expecting Miracles is Back! 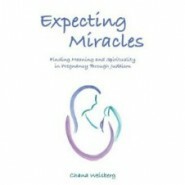 Over the past 11 years since I wrote my 1st book Expecting Miracles: Finding Meaning and Spirituality in Pregnancy through Judaism, I have worked on many, many projects. I’ve written zillions of articles and made zillions of videos. But, between us, Expecting Miracles, a collection of interviews with frum mothers talking about pregnancy, is the project that I loved and still love the very most. It’s my JewishMOM cherry on the top. Unfortunately, for a few years now Expecting Miracles has been nearly impossible to find. Which has been really disappointing for me as well as the dozens of women who have contacted me over the years looking for a copy for a pregnant friend or themselves. So I just wanted to share the good news that, b”H, Expecting Miracles is now back in bookstores and on sale online. I love that book! I read that way before I even heard of you or this site! Expecting Miracles got better each time I read it and enabled me to really feel the birth of our last child as a spiritual event. I’m so glad someone lent me a copy before I gave birth to my first. I had done a lot of physical and emotional preparation, but it hadn’t occured to me that birth could be practically spiritual. Each birth has gotten better in the spiritual department – my latest (whirlwind quick homebirth with surprise twins) was really powerful. So glad it’s in print again – it’s really a transformative read. BH! It’s such an amazing book. So great I can find it in stores now. I’m so glad it’s back in print! I love that book too, i’ve lent it out countless times and recommended it many more times. i’ve created a series of shiurim on spirituality in pregnancy & birth inspired by your book, and keep on recommending it. I saw it in our local sefarim store last week and I was so glad! How I loved that book…it helped me to feel not alone in those dark, lonely pregnant moments when I was scared of everything. Thanks for the inspiration and I look forward to reading it again! Can you tell me please which shops are selling it? I have terrible problems with postage for an online buy. Pomerantz downtown has a zillion copies 1-800-Judaica. I think they do free deliveries. But, over by you, maybe call the huge Mannys.